The Visayas is a huge area of cultural and ecological importance in the central-eastern region of the Philippines islands. It holds the highest concentration and variety of world-class dive sites in the country, and many locations exhibit iconic Coral Triangle biodiversity of corals, fish, and invertebrates. 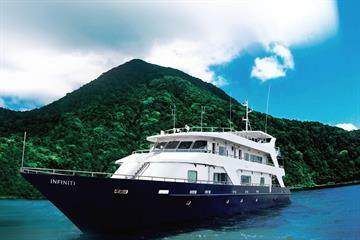 A liveaboard is by far the best way to see the underwater cream of the crop in this geographical area; by no other method can you hop from diving gem to gem on a number of unique islands. Malapascua is one of the Visayas premier dive destinations, and its claim to fame is thresher sharks. For more information on Malapascua and its incredible dive sites (with sharks and more), see the detailed information on liveaboard.com's Malapascua page. Besides Malapascua, Cebu's premier dive locations include Pescador island in Moalboal, Sumilon island, and Mactan island. Moalboal is the home of a mind-blowing school of sardines, a huge fish ball that moves at lightening pace to form and reform different shapes. Sometimes, divers here are lucky enough to see pelagic predators attracted by the food. Sumilon island was the first marine protected area of the Philippines. It had a rocky past, having been dismantled, overfished, and then re-protected, but it remains a site where sharks and great marine life can be seen. Mactan offers coral gardens and hammerheads just off of Cebu City's metropolis. The top Negros dive locations are led by Apo Island. This small island off of Negros' south coast remains the most famous and successful community-based marine protected area in the Philippines. Landscapes of 100 percent healthy hard coral cover are the big draw at Apo, as well as its legions of turtles. Dauin, on the other hand, is a muck-diver's paradise. Cuttlefish, octopus, seahorses and frogfish are just a few of the many macro favorites at sites like the Cars, two sunken Volkswagens that make a wonderful artificial reef. Bohol's premier dive locations include Balicasag island off of Bohol's south coast, home to a marine protected area that offers a seagrass meadow with ever-present green turtles, a wall that fusiliers and patrolling jacks flash by, and a shallow coral garden festooned with colorful, dancing fish. Cabilao island is another often-visited dive location in Bohol; this is where pygmy seahorses can be seen. On nearby Siquijor, a province of its own, some local marine protected areas offer beautiful coral cover and large schools of full-sized reef fish. Volcanic Camiguin just north of Mindanao adds underwater marvels to a rugged mountainous landscape that contains more volcanos per square meter than any other island on the planet! To the east, Southern Leyte offers some beloved walls and coral gardens, macro-critters, and seasonal whale sharks in Sogod Bay, near the municipality of Pintuyan. The length of liveaboard itineraries in the Visayas can be 6, 7 or 10 nights (and the Siren offers 13 nights on a special transition trip from Palawan to Cebu). 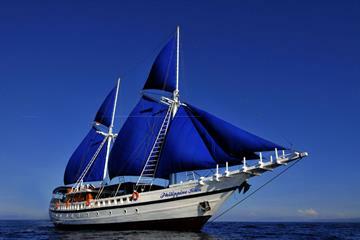 Visayas liveaboards budgets range from around 280 to 450 euros per night. Some of the top sites on liveaboard.com's itineraries are Apo Island (Negros), Pescador Island on Moalboal (Cebu), Dauin (Negros), and Balicasag (Bohol). Itineraries including Malapascua either combine the thresher sharks with Southern Leyte, or with a whole slew of other Visayas favorites in Negros, Bohol, and Cebu. Southern Leyte is also sometimes combined with Camiguin and Bohol. Liveaboards in the Visayas range from the super luxurious S/Y Siren with its billowing sails to refurbished merchant vessels and dedicated M/V diving yachts- all enjoy different degrees of luxury, but consistently offer great diving amenities. The experience level required by Visayas liveaboards is generally Open Water, with either ten or twenty dives, depending on the itinerary. The exceptions to the rule are one trip on Solitude One requiring Advanced Open Water and 50 logged dives, and the M/V Discovery Palawan's trip departing from Batangas (which is not technically within the Visayas). The latter requires zero logged dives, and even offers two simultaneous activity plans, one for divers and one for non-divers who enjoy snorkeling and land trips! Select dive sites in the Philippines definitely experience current, but the country is not as infamous for fast-moving water as the Maldives or Indonesia. You'll depend on your dive guide to advise you of any particular challenges or experience requirements at a given site. The eastern Visayas, which include Cebu, Bohol, and Leyte, experience a wetter climate year-round than Siquijor and Negros in the central Visayas. Leyte is especially wet during the winter of the Amihan season (northeast monsoon); from December through February, winds from the Pacific Ocean can dump loads of rain on dive sites in Southern Leyte. Typhoons are also expected from November through January, especially affecting Leyte and the north half of Cebu. During either monsoon (the southwest monsoon is called Habagat), winds can whip up the waves with or without rain. In sum, Visayas trips are recommended year-round except for during typhoon season and the rainiest months (late November through February). Dive operators know which sites to visit during which season and can always find the appropriately sheltered area for great diving. However, some liveaboards will spend March through June solely in Tubbataha to make use of the shorter diving season there. 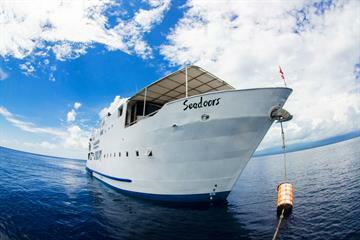 Cebu City and Malapascua are two common liveaboard departure locations for Visayas liveaboards. Cebu City is a booming metropolis and the regional capital of the Visayas, with a port that sends ferries, cargo ships, and liveaboards out in every direction. Getting to Cebu City is easy with a 1.5 hour flight from Manila or direct flights from select Southeast Asian countries nearby. International flights can get to Cebu City via a transfer in Asia. Malapascua, on the other hand, has no airport, but it can be reached by taxi, van, or bus (and small boat). From Cebu City, getting to Malapascua requires a five hour bus journey; taxis take about half that time. However, due to the variety of destinations and itineraries, in the Visayas, Moalboal (in Cebu) and Dumaguete (in Negros) are also sometimes used as the port of departure for some Philippines liveaboards. Moalboal is best reached by bus from Cebu City, or by bus and short ferry from Dumaguete. Dumaguete, on the other hand, enjoys its own airport as the provincial capital of Negros Oriental. A flight of about one to two hour's time can get you from Manila or Cebu City to Dumaguete, which entices travelers with its hip university-town vibe, lovely waterfront promenade, and great eats. Dumaguete is also the place to arrange trekking tours in Mt. Talinis, one of the very few original forests left on Negros.